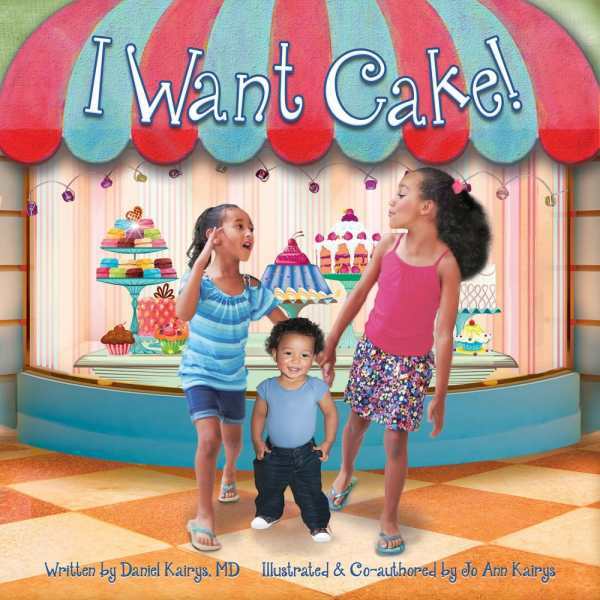 A delectable picture book, I Want Cake! will capture children’s attention and dazzle with beautiful illustrations. Spectacular layered illustrations and a playful story combine in I Want Cake!, a deliciously entertaining children’s book. With its bright colors and childlike logic, it is sure to satisfy. One morning Leen wakes up and tells her sister she wants cake. After her sister, YaYa, reminds her that they have not even eaten breakfast yet, Leen convinces her that maybe they can have just a little bit of cake. Thus begins their adventure to find cake, with little brother Jaden tagging along, as younger siblings tend to do. This is the second book from authors Daniel Kairys, and Jo Ann Kairys. Inspired by Daniel’s daughters’ story-making, the child-friendly language and kid-logic will keep youngsters turning the pages, wanting to see what the siblings and their friends and family will come up with next. This is most evident after they ask their mom for cake for breakfast: “‘It’s too early for cake. How about some lambi ak jon jon?’ Mommy asked.” The girls respond with: “What? That’s snails with mushrooms! Quick! Run away!” Parents will get a laugh, too, at such offerings as snails and mushrooms, books, or a bike tire instead of cake. Jo Ann Kairys’s digital collage illustrations are striking. The book has photographs of the characters layered onto bright, cheery backgrounds, which feature collages of various styles, from paintings to whimsical drawings to photographs and more, all layered to give a sense of depth and create an enthralling and captivating page. Each illustration has something new and different to delight in. Entirely different from most children’s books, I Want Cake! stands out. The easy-to-read layout features text on one page and an illustration opposite. Even the font is fun, while still readable. The end of the book includes a recipe for a vegan vanilla cake, and some information about the positive environmental impacts of making vegan or dairy-free food. A delectable picture book, I Want Cake! will capture children’s attention and dazzle with its brightly colored illustrations. Its fun story and humor will keep readers coming back for more.